Submitted by Faloth on 2019-02-03 10:23. 17 years in the making! This massive persistent world combines two former projects into one seemless world. Explore and create your own PC's without the typical boundries of the game. 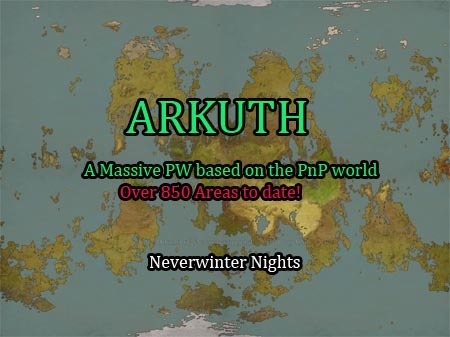 Arkuth provides you "the player" with never before seen creativity, new systems and exciting action. We focused on building a unique experience that no other servers offer. No annoying or pushy DM's (they are not required, ever!). No restrictions (save a few), complete gameplay as all great PnP games would offer. No RPing required, but encouraged. No Monty Hall BS. You earn everything on this server. We cater to dedicated players and strive to make this server/module the best one availible. Come help this PW thrive. -Attract followers that stay by your side and level up with you w/ persistent inventories! -Horses, custom mounts, and MP jousting! -Plenty of unique Henchmen throughout the realm to hire and abuse. -Gambling, races, auction houses, pack animals, quests and much much more! This world grows almost daily and with your help it will continue to grow and be a great place for all to enjoy. Fantastic module! It feels more like a real world then any other I've played on. You start in a bar, there are lots of NPC's to talk to, a henchmen in a corner, a barmaid, a guy dealin cards and even people bar fighting. Then you step outside and into the BIG world that's filled with things to do. Guards are watching everyone, commoners everywhere, tons of buildings to explore. You almost instantly forget that you just want to level up like on most other servers. It's a nice change of pace, it's well thought out and I'm looking forward to all the areas beyond the starting town. EXCELLENT! Thankyou very much. Any constructive critisism is welcome :) Please visit padnd.com to leave any additional comments via our NWN forum under padnd's official forums. Jumped on this server and was pleasantly surprised. Well laid out, plenty to do. Hopefully people continue to join in. Looking forward to seeing this server grow. Build it and they shall come! Thanks for the comment. Please visit padnd.com for more info. This is my favorite server so far. I play as often as I can, but life slows you down sometimes. The world has so many good exploration areas. Great people to meet and tons of user friendly vendors. I've found all kinds of new items I've never seen before, lots of henchmen to hire and plenty of crafting gear. You seem to be able to customize almost anything in Arkuth. This server is being overlooked by way to many players. Can I load the module somehow and play offline? Hey Andert! Sorry it's not availible offline. MP only ;) However I will let you know that the crashing / offline has been resolved. The module is now very stable and runs 24/7/365 ommiting any server upgrades / power outages etc. Ping rates are dependant on your location. Our server is located in Western Canada. :) Thanks for the comment. See you soon! Recently started exploring this module, and the world is densely packed with flavor and interesting things to do. Still under active development, so you never know what surprises will be around the corner! An excellent experience, definitely recommend giving it a try.